SNES Pink Panther in Pink Goes to Hollywood (USA) in 09:35.78 by wesen. 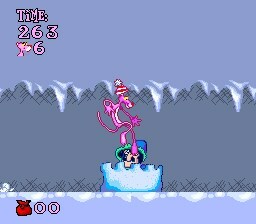 Pink Panther in: Pink Goes to Hollywood is a platformer from Manley and Associates released in 1993, which was published in Europe and the US by TecMagic and in Japan by Altron (where it was simply known as Pink Panther). The game follows the Pink Panther's adventures across numerous film sets in Hollywood, trying to find fame and fortune while eluding the tenacious Inspector Clouseau. wesen improves the upon the previous SNES publication by 12.28 seconds, thanks to new routes and strategies. There is also a Genesis version of the run also created by wesen.